Shattered house in Bartow County, Ga. When super cell thunderstorms and tornadoes barreled across the south on April 27, it left a swath of damage across Alabama and Georgia that will take years to repair. Local churches have stepped in to minister to the people affected by the storms and who lost homes, possessions and loved ones. A Disaster Relief team from Peachtree Community Church in Villa Rica traveled to Adairsville, Ga. on May 9 to assist local residents. The group first traveled to NorthPointe Church in Adairsville which has become a central location for relief efforts in the area. The church is home to a local food bank and has built upon that ministry to bring in more food to displaced residents. The church is also accepting clothing donations and has essentially set up on clothing store in the church gym that is free to those in need. Other household items and toys for children are also available. NorthPointe had received shipments of food from the Atlanta Community Food Bank and the Peachtree volunteers were tasked with visiting the hardest hit areas of Bartow County to find residents in need of food boxes and hygiene kits. Many of the homes visited by the Peachtree team were along Cedar Creek Road, Crowe Springs Road, and Spring Place Road in Bartow County near Cartersville. As is characteristic of tornadoes, there were areas of severe damage interspersed between areas of almost total normalcy. Some areas were so devastated that they looked like a set of Gone with the Wind after the Union Army had slashed and burned its way through the plantations of antebellum Georgia, complete with flattened houses and shattered trees. The cyclonic winds were evident in the way that trees were often toppled in the same direction like a gigantic crop circle. In some cases, trees remained standing but leaned in what had been the downwind direction. Other trees stood upright but were devoid of limbs. The houses in the area had varying degrees of damage. Many sported blue tarps where shingles were missing or trees had been dropped through the roof. Others were missing porches. One disabled veteran pointed out where his detached garage had been picked up and dropped against the side of his house. All too often the houses were damaged beyond repair. Some had already been bulldozed or demolished by heavy equipment. In others, little remained standing to demolish. In one home, a pastor’s family had survived the night in an interior room, one of the few rooms left standing in the house. The roof had been picked up and deposited in the in-ground swimming pool. A family friend explained that the family had held on to each other even as their shoes were pulled from their feet by the winds. A Peachtree team member pointed out where a friend lived on the next street. The friend’s child had hid in the bath tub clutching a Bible. The mother and father joined her there. A tree fell across the tub just missing them, followed by the roof collapsing on top of them. All survived but there is only bulldozed red Georgia clay where their house once stood. A few miles away, a family is living in a camper trailer in front of their house. They point to the one-story house and say that until the night of the storms it was a two-story house. The nine members of the family, including two small children, hid in an interior closet on the first floor of the turn-of-the-century farmhouse as the storms approached. When they came out, they looked up a staircase next to the closet and realized that the top of their house was gone, along with the front porch. The patriarch of the family joked that he was going to move lounge chairs to the second floor and use it as a sun deck. Just down the street stands a stone chimney on a hill. It is all that remains of the house that stood there until two weeks ago. The family, which now lives in an RV, rode out the storm in the basement under the chimney while the house collapsed above them. They were trapped in the basement a short time until rescuers arrived. Another man describes how lucky he was that “we only lost half of our house.” His son, an EMT/firefighter who lived several miles away was so worried about his parents that, when the roads were blocked two miles from the house, ran through the woods in the middle of the night as a second line of storms hit to check on them. The father, speaking with obvious pride, says that his son pulled four people from the wreckage of their homes that night. No lives were lost in Bartow County that night. A common thread among the survivors is thankfulness. They are grateful for their lives and for the assistance that their fellow Georgians have offered. One man tells us that since a media event staged by national groups like the Red Cross, Salvation Army, and United Way in the early days after the disaster, those groups have been noticeably absent. He says that most of the assistance has come from local churches and ministries. This may be a result of the fact that the United Way and Salvation Army are set up with the Federal Emergency Management Agency at the Clarence Brown Conference Center in Cartersville. The Salvation Army is providing meals and clothing and the United Way is providing funds in cooperation with FEMA. Many residents are probably not aware of this assistance since several told us that, although they have electricity, they have not had cable or phone service since the storms. People in need of assistance from this shelter should call the conference center at 770-606-5763 or visit in person at the intersection of I-75 and Ga. Hwy. 20 West. This is at exit 290 on I-75. The street address is 5450 State Route 20 in Cartersville. Those in need can also contact the Bartow County chapter of United Way at 770-386-1677. Likewise the Red Cross has also been involved in the area. The Northwest Georgia Red Cross says that they have been very involved in the past weeks, but are now scaling back their efforts since many of their clients say their needs have been met. The Red Cross did not set up a shelter in this case, but did provide over 3,000 meals through mobile feeding, health services, and is now beginning to focus on case work in cooperation with FEMA. 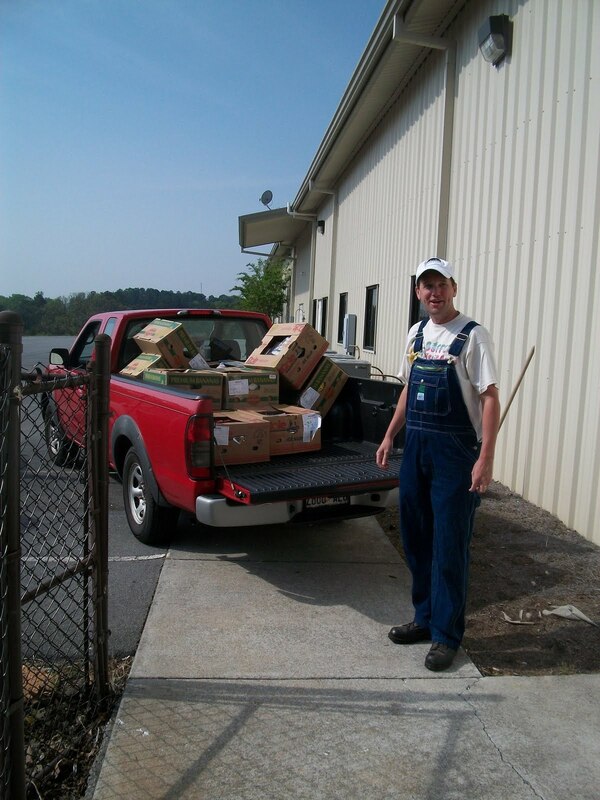 While in Bartow County, the Peachtree team members delivered boxes of food that were sent to NorthPointe church by the Atlanta Community Food Bank. They also helped to clear debris when needed by homeowners and often just lent a sympathetic ear to the tornado victims. The inspiration for the journey and work was the love of God and compassion for their fellow Georgians. The following day, other members of Peachtree met at the church in Villa Rica to sort items that had been donated for the relief work. A second trip is scheduled for Wednesday, May 11, to Spalding County to assist in the tornado-damaged areas around Griffin. A multi-day trip to Tuscaloosa, Ala. is being planned for sometime around the end of May. If you would like to donate or assist in tornado relief efforts, you can contact Peachtree Community Church at 770-459-1717 or you can visit the Peachtree Disaster Relief page on Facebook. In the Bartow County area, people needing or offering help can also contact NorthPointe Church at 770-387-8135. As FEMA and insurance companies step in, NorthPointe will be turning over much of the relief work to local charities. One of these is Lighthouse Ministries of Cartersville. They can be reached at 404-368-5850 or by email at ministryoflight2011@gmail.com.